Tiji Festival is a world renowned festival, celebrated in Lomanthang, the capital of Upper Mustang. Every year, Tiji festival is celebrated for 3 days to please the Lord and ask the rain. If you are interested in the cultural trek or interested to explore the festivals, go to Upper Mustang and enjoy the Tiji festival. The festival has its connection with the life in the Himalayan rain shadow area. It remains drought throughout the year and rain brings a huge meaning to ease the day to day activities. During the cultural performance in Lomanthang, they perform chorus dance with masque and unique garments. Besides the festival, you can enjoy exploring the ancient Buddhist heritages. 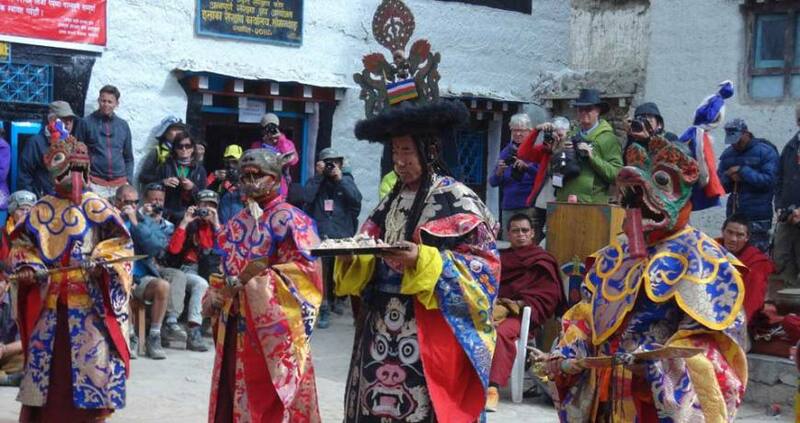 Nepal Kameleon Holidays organize guided Upper Mustang Tiji Festival Trek based on the Tiji festival calendar. Day 01: 2018 May 04: Arrive in Kathmandu (1350 meters). Day 02: 2018 May 05: Kathmandu Sightseeing and Trek Preparation. Day 04: 2018 May 07: Fly to Jomsom and trek to Kagbeni (2858 meters). 3-4 hrs. Day 05: 2018 May 08: Kagbeni to Chele (3050 meters). 5-6 hrs. Day 06: 2018 May 09: Walk Chele to Syanbochen (3475 meters). 6-7 hrs. Day 07: 2018 May 10: Walk Syanbochen to Ghaymi (3520m). 5-6 hrs. Day 08: 2018 May 11: Walk Ghaymi to Charang (3500 meters). 4-5 hrs. Day 10: 2018 May 13: Explore Lo-Mangthang, 2nd day of Tiji festival. Day 11: 2018 May 14: Explore Lo-Mangthang, 3rd day of Tiji festival. Day 12: 2018 May 15: Walk Lo-Mangthang to Drakmar (3810 meters). 6-7 hrs. Day 13: 2018 May 16: Walk Dhakmar to Ghiling (3806m). 5-6 hrs. Day 14: 2018 May 17: Walk Ghiling to Chhuksang (3050 meters). 5-6 hrs. Day 15: 2018 May 18: Walk Chhuksang to Jomsom (2700 meters). 6-7 hrs. Day 16: 2018 May 19: Fly back to Pokhara. Day 17: 2018 May 20: Drive from Pokhara to Kathmandu. Day 18: 2018 May 21: Departure. Upper Mustang restricted area entry special permit (Special Trekking Permit US$ 500 per person for 10 days that begins from Kagbeni to Kagbeni. If you want to stay more than 10 day, US$ 50 per day / per person will be charged, which is not included in this trip cost). Pokhara - Jomsom - Pokhara flight. 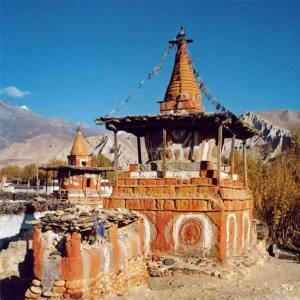 If you have less time and you want to do jeep safari to Upper Mustang, we will organize it. Flight cancellation or delay is not the issue of our control. You need to cover the extra night accommodation and meals by yourselves in this condition. Day 012018 May 04: Arrive in Kathmandu (1350 meters). Day 022018 May 05: Kathmandu Sightseeing and Trek Preparation. Day 042018 May 07: Fly to Jomsom and trek to Kagbeni (2858 meters). 3-4 hrs. Day 052018 May 08: Kagbeni to Chele (3050 meters). 5-6 hrs. Day 062018 May 09: Walk Chele to Syanbochen (3475 meters). 6-7 hrs. Day 072018 May 10: Walk Syanbochen to Ghaymi (3520m). 5-6 hrs. Day 082018 May 11: Walk Ghaymi to Charang (3500 meters). 4-5 hrs. Day 102018 May 13: Explore Lo-Mangthang, 2nd day of Tiji festival. Day 112018 May 14: Explore Lo-Mangthang, 3rd day of Tiji festival. Day 122018 May 15: Walk Lo-Mangthang to Drakmar (3810 meters). 6-7 hrs. Day 132018 May 16: Walk Dhakmar to Ghiling (3806m). 5-6 hrs. Day 142018 May 17: Walk Ghiling to Chhuksang (3050 meters). 5-6 hrs. Day 152018 May 18: Walk Chhuksang to Jomsom (2700 meters). 6-7 hrs. Day 162018 May 19: Fly back to Pokhara. Day 172018 May 20: Drive from Pokhara to Kathmandu. Day 182018 May 21: Departure.